Ken Houston's son is about to graduate and that means Dad can relocate for a new job! If you need a camera-friendly, engaging, charismatic veteran who is comfortable, confident and commanding---this is your guy! 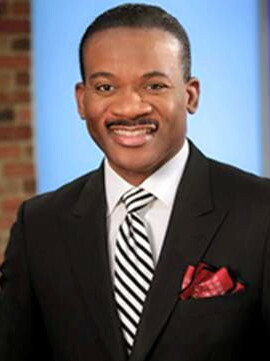 Currently working for the State of Michigan, his most recent TV news gig was as an anchor/reporter in Lansing. Please consider him! See all of Ken's clips. WILX-TV, Lansing: Primary Anchor and Special Projects Reporter (2015-2017). Assisted with producing and writing of daily news broadcast. Hosted station programs. Heavily involved in the community. Constant interaction with viewers via social media. Team player and multi-tasker. Canisius College, Buffalo: Recruiter (2012-2015). Mentored students on the fundamentals of writing speeches, scripts for broadcast and classroom essays. Coached students on the art of public speaking and performing before an audience. Encouraged students to discuss current events each day, culminating in an end of semester debate. Researched and developed curriculum designed to prepare students to compete in a competitive marketplace. State of New York, Buffalo: Press Secretary (2010-2012). Advised on all matters relating to media relations and communications. Wrote scripts and talking points for Senator. Evaluated and scheduled requests for media interviews. Bridges TV, Buffalo: Host (2007-2009). Hosted news/talk program. Produced and scheduled guests for interview segments. WKBW-TV, Buffalo: Anchor / Nightside Reporter (2003-2006). Anchored nightly 5:30 pm newscast. Reporter for nightly 11 pm news. Anchored nightly 5 pm and 9 pm newscasts. Reported on stories for nightly 11 pm news. WDAF-TV, Kansas City: Anchor/Reporter (1993-1995). Anchored news updates for morning show. Reporter for mid-day show. University of Kansas, Lawrence: Major: Radio, TV & Film. Tennessee Associated Press Award; Memphis Writer's Conference Award. Barb Roethler (former supervisor), News Director, WILX-TV, Lansing, 517-393-0110. Nancy Sanders (former supervisor), Newsroom Manager, WIVB-TV, Buffalo, 716-874-4410. Lisa Polster (former co-worker), News Director, WIVB-TV, Buffalo, 716-874-4410. I got a fantastic deal with my station here thanks to all the great hits/leverage I got from Collective Talent. Of course... I'll need to cancel my account for now... but I'll be back in a couple years, I can promise you that.